NEW SERVICE – CUSTOM MILLING AVAILABLE! Nestled in the historic 18th-century of Lititz, Pennsylvania, Sylvan Brandt has been dedicated to perfecting the art of beautiful, high-quality antique, reclaimed, and resawn flooring for three generations. Our flooring graces hundreds of well-appointed homes, adding not only value, but old-world charm, elegance, and beauty to your home. Family owned and operated since 1960, you will not find another company more committed to your satisfaction. We ensure that every floor is unique by carefully selecting the finest timbers and reclaimed boards from local historic homes and barns. We ship nationwide and are dedicated to finding the best shipping option for you. "Amazing experience from day 1 of ordering. Great professional family atmosphere. Best decision we made in regards to renovation. We purchased the weatherboard flooring, and not a day goes by that we don't look at it in awe!" "I have been working with Sylvan Brandt for many years. 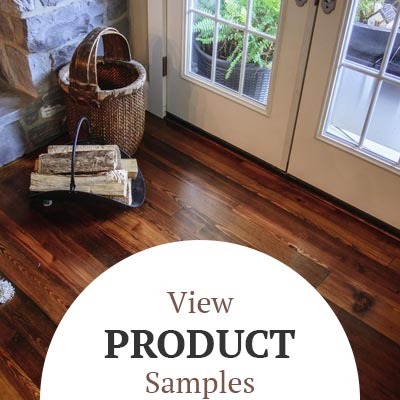 We typically purchase reclaimed flooring and beams for our design projects and wood for our cabinet making business and they have always provided consistent quality and prompt delivery..."
"I've been working with Sylvan Brandt for years. Their salvaged products, ranging from antique flooring to architectural elements are a complete joy to work with, and when used, yield an incomparable end result..."
"When we decided to remodel our kitchen & living room I knew I really wanted to incorporate reclaimed/barnwood in some way. Unfortunately redoing our whole floor (a great desire of ours) was not feesable, but we were able to use it for framing, fireplace surround and..."
"My wife and I were looking for (and purchased) reclaimed Antique heart pine. The showroom is well laid out and gave us a precise look at the installed product. Staff knows the product inside and out; they are friendly, responsive, easy to work with. The flooring was delivered on time and..."
"I went to Sylvan Brandt in search of the Ultimate Antique Heart Pine. I met Dean, he showed me Heart Pine in his showroom and in his mill and I took some samples with me. In the weeks following Dean and I worked by phone and email towards a custom order for him...."
"We are a full service Hardwood Flooring Company out of West Chester Pa. We have used the products and services of Sylvan Brandt for some 20 years now. They are unquestionably the premiere company for re sawn antique flooring in the tri state area!! Their prices quality and...."
"I've been a very satisfied repeat customer going back almost 4 years. All the people there are great and the prices are good. It's hard to find a company offering such a large selection of reclaimed lumber so I feel lucky to have found them online."